About three weeks ago, I met my friend Rachel for a movie at Magnolia Theater in West Village. We got there early, so we decided to pop in Club Monaco to check out the new spring arrivals. When I walked through the door, it’s like the heavens opened up! 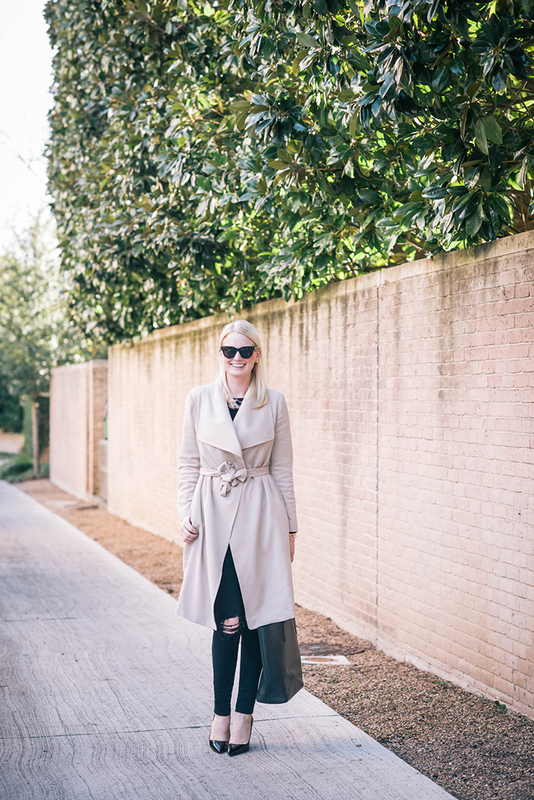 My eye went straight to this classic, camel coat – are we surprised? Nope! I’d been on the lookout for a staple coat in this creamy shade for what seems like ages, but every time I found one, the price tag made me double over. 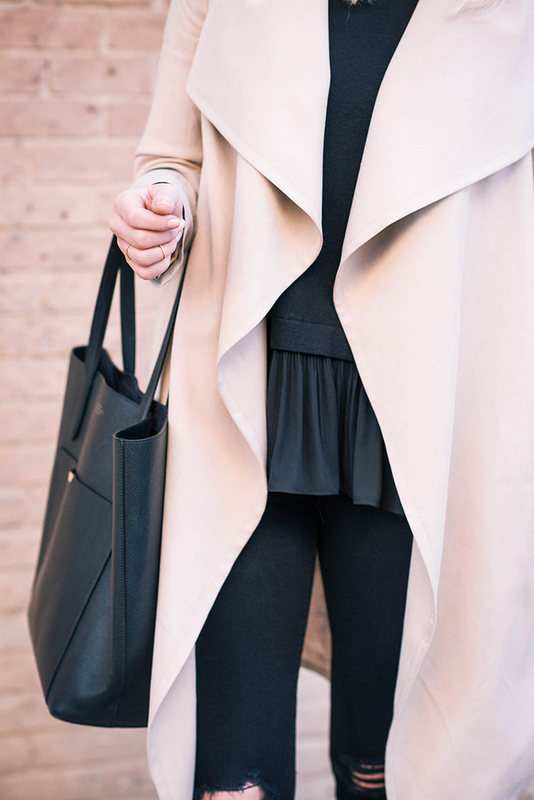 This light coat is just under $300, and since it’s such a beautiful basic, that seems like an awesome price to me! Another item I picked up on my trip to the Club is this ruffle-hemmed sweater. The little details are what make sweaters like this one a no-brainer. Not only is the bottom adorable, the entire back is pleated! I didn’t get a great pic of the pleating, but you can check it out here. Club Monaco is sometimes hit or miss for me, but their spring collection boasts timeless, elevated staples like this minimalist black dress, this silk ruffled cami, and this leather-sleeved blazer. One other item I’d really love to pick up for spring is this ethereal white dress – it’s a great transitional piece with the 3/4 sleeves! 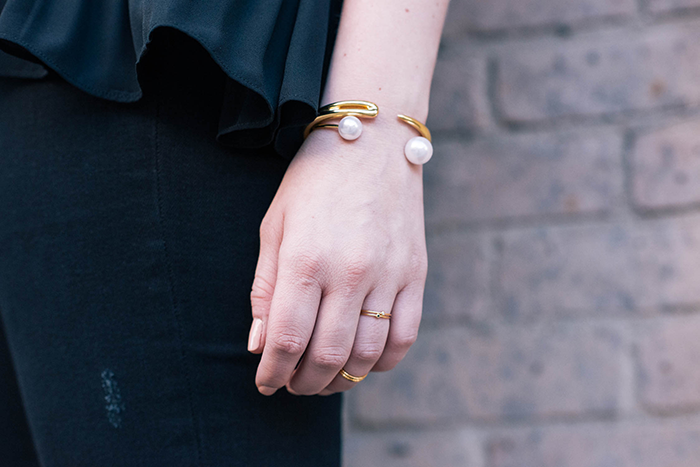 Click here to discover the rest of Club Monaco’s spring collection! Classic look, love the sweater. Love this. 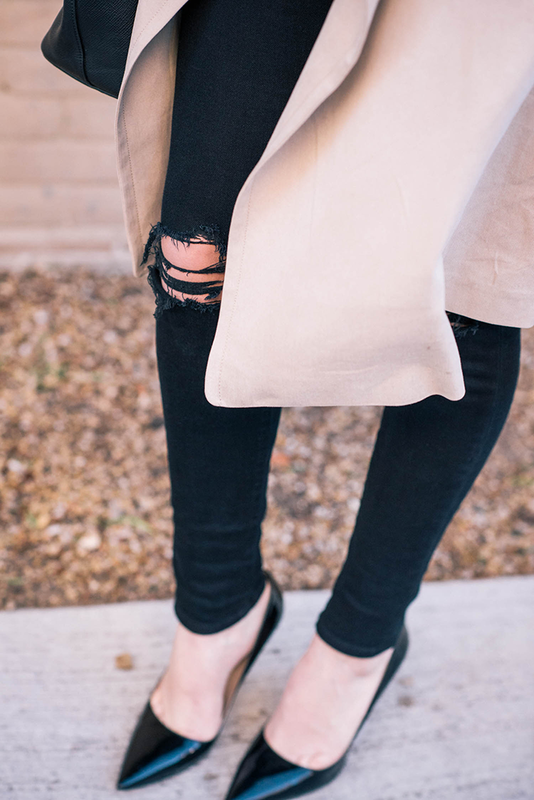 The trench coat brings it into new level! such a gorgeous, classic look! head to toe perfection. I adore that peplum-ish sweater. 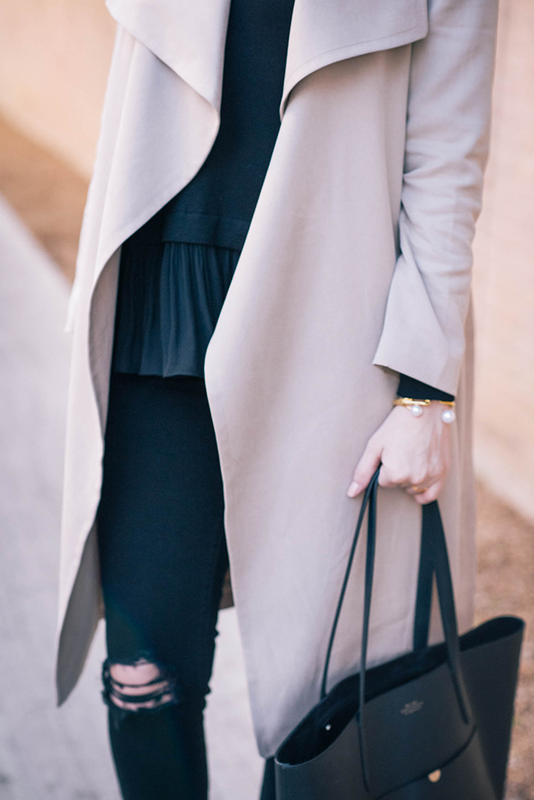 Such a chic neutral look – love that coat! That jacket is fantastic love the shape and relaxed vibe! Love the ruffle hem on your top! This is such a beautiful look with some many fun touches. Hope you are enjoying NYC! I love the ruffles in your sweater! I also need a good staple coat like that one! Love this look, and great find! This coat is amazing! Another beautiful look! I love that flirty top! Absolutely LOVE this look! 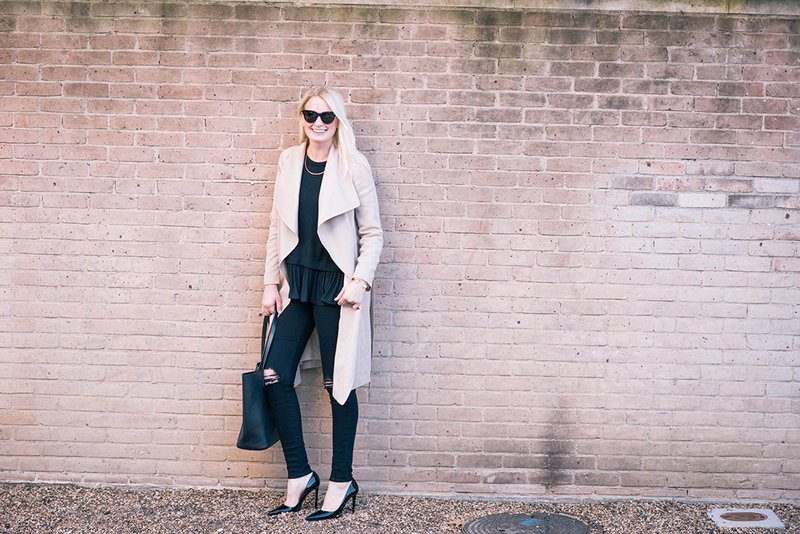 Can never go wrong with a camel coat! 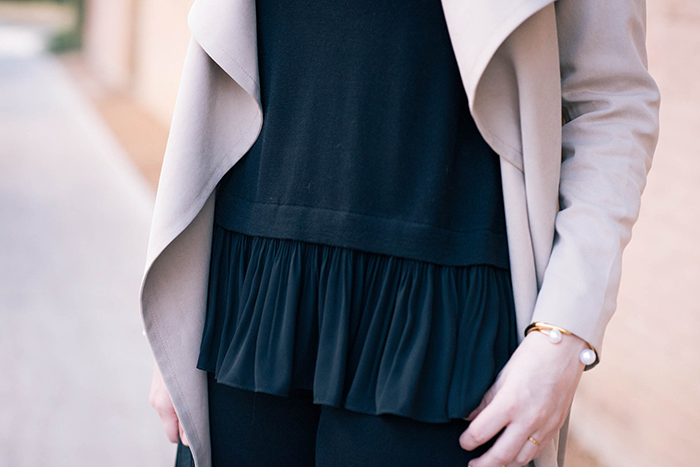 love the black palette with that trench! perfect styling! Love your top. And yes, that coat is beautiful! This look is incredible- i would wear this in a second. Love love that coat! looks different when you wrap it up. for a good black stiletto?